We are here to assist you before, during, and after the sale. Try our products today or give us a call and we will be glad to assist. These lights are ideal to use in machine sheds, warehouses, farm buildings, Morton buildings, pole barns, gymansiums, work shops, etc. T5 lights give off almost twice as much light as a T8. These T5 fixtures are the latest and greatest. This listing is for 1 of these lights fixtures. What color is 5000 kelvin? 5000 kelvin is like stepping outside at noon on a sunny day. The lamps will be 28 watts, 3200 lumens. 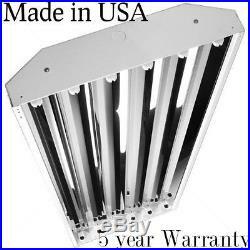 These are equivalent to the 5000 lumen T5 fluorescent fixtures. If you are using these fixtures on a daily basis for 8+ hours, this LED option is definitely a good choice because of the energy savings and maintenance costs that you will save. How many lights do I need? Generally speaking, take your square footage and divide it by 400 and this will give you the number of lights you need. 1 Fixture Type: 6-lamp, 54 watt T5HO. 2 Lamps: 5000K lamps included if purchasing 4 or more fixtures. 4 Hard Wire 120/208/240/277V-volt HFA1 High Bay Fluorescent, Standard Specular (86%). 5 Set up to be surface mounted. Can include v-clips for hanging by calling in your request prior to purchasing. 6 Lamp 54W T5 LED, Program Start Ballast Multi-Volt HFA1 series high-bay fixture is a great energy saving alternative to traditional HID high-bay fixtures. This fixture operates six lamps and as a standard feature comes equipped with Howard ballasts. Benefits of LED high-bay luminaries include: Energy Saving Compared to HID systems Exceptional Color Rendering High System Efficacy Long Lamp Life Instant On. APPLICATIONS Warehouse Manufacturing facility Retail Store Gymnasium Cafeteria Auditorium FEATURES Easy access to wiring compartment & ballast Access plate provides access to electrical wiring without the need to open the fixture Knock-outs for easy electrical wiring and assembly. 0502 Frequently Asked Questions: 1 What brand are these light fixtures? Yes, the ballast on these lights are warrantied for 5 years (materials only). 3 What voltage are these lights wired for? These lights are ready to be installed for any 120, 208, or 277 volt application. Call for details on this. 4 How do I wire and mount these? It is always recommended for these to be installed by a licensed and experienced electrician. 5 What do are people saying about your products and services? Customers have been very pleased with us and our products... We offer customer service and installation assistance before, during, and after the sale. 7 Where are these high bay linear fluorescent light fixtures typically installed? These high bay lights are installed in a variety of locations. Manufacturing environments, warehouses, indoor baseball batting cage and training facilities, gymnasiums, pole barns, metal buildings, woodworking shops, and any other area where you need alot of light. 8 Will these lights work in cold environments? The ballasts in these high bay linear fluorescent lights are rated to zero degrees, but work in even colder environments. We are located in Illinois and have some pretty cold winters and have not experienced any issues with these lights in any of our unheated/heated warehouses. Dependable and economical, we like the product and know that you will too. The item "(INCLUDES LED BULBS) 6 LAMP T5 HIGH OUTPUT HIGH BAY LIGHT FIXTURES" is in sale since Saturday, October 29, 2016. This item is in the category "Business & Industrial\Building Materials & Supplies\Lights & Lighting\Industrial Lighting Fixtures". The seller is "corslighting" and is located in Jacksonville, Illinois. This item can be shipped to United States.